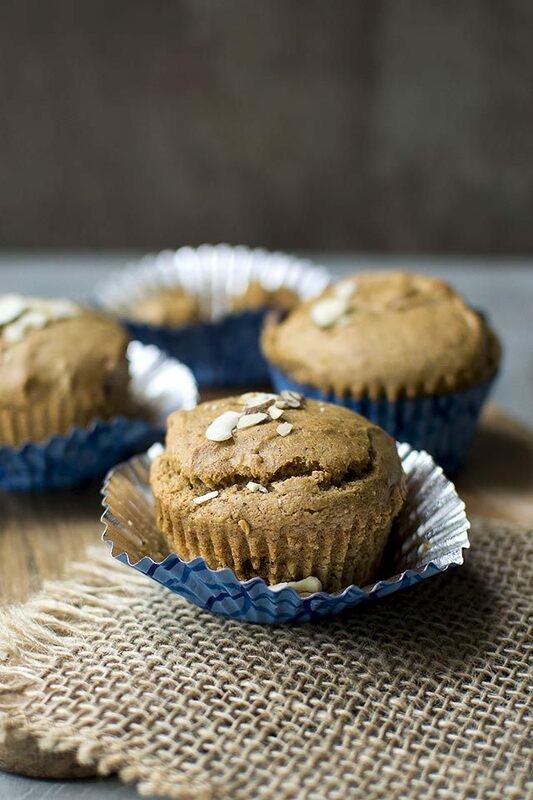 This Almond Butter Chocolate Chip Muffins are moist, soft and delicious. They are great as grab-n-go breakfast or as a quick afternoon snack. Preheat the oven to 375°F. Line a muffin tin with papers and coat the liners with cooking spray. Combine almond milk and vinegar in a measuring cup and set aside for 5~10 minutes to cuddle. In a medium bowl, whisk together flours, baking soda, baking powder and salt. In a large mixing bowl, beat the oil and sugar together until light. Add the almond butter and mix until incorporated. Add the vanilla and the egg replacer mixture and mix until evenly mixed. Next add one-third of the dry ingredients and mix until moistened. Add half of the almond milk and mix until combined. Then add the remaining dry ingredients and the remaining milk. Mix well. Finally stir in the chocolate chips, if using. Divide the batter evenly in the prepared pan. Sprinkle with slivered almonds on top. Bake the muffins for 23~25 minutes or until a cake tester inserted into the center comes out clean. Remove from the oven and allow the muffins to cool in the pan for 5 minutes, then turn them out onto a wire rack to finish cooling.